This year: Social Security’s first deficit. On Monday, I announce my retirement. 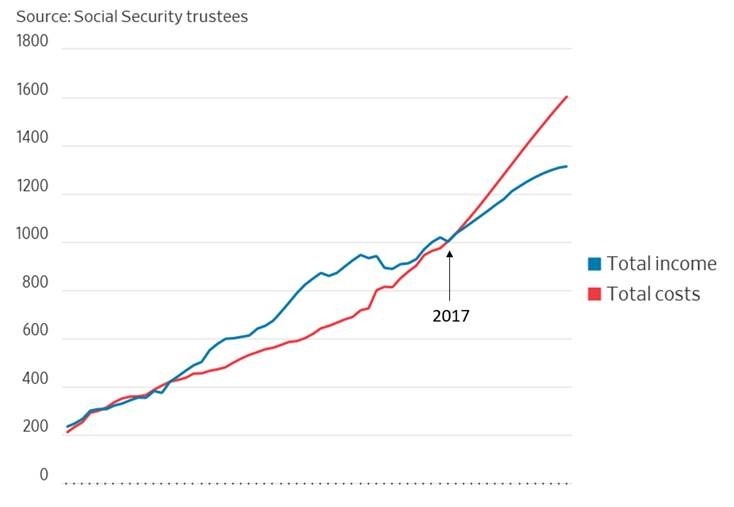 On Tuesday, the Social Security Trust Fund – the lockbox that doesn’t have a lock – announces that Social Security will run a deficit this year… 3 years ahead of last year’s future projection. That is, outflows (payments to 61.5 million people like me) – will exceed inflows (taxes collected from current workers and their employers … and, interest earned on the trust’s assets). I know there may be a temptation to accuse me of being the straw that broke the camel’s back, but …. Except to the reality of hitting the crossover point, this isn’t new news. Everybody knows that Social Security (and Medicare) are on shaky financial grounds. Current forecasts have Social Security running out of money in 2034 … thanks mostly to us baby boomers dipping into the pot … and, accelerated by the surging number of disability claimants. I sleep well at night knowing – based on my robust Excel analyses – that I personally won’t be playing on house money until about 2033. Until then, I’ll simply be drawing out the bucks that I threw into the hopper when I was gainfully employed. After that, if Social Security still exists, I’ll be a burden on younger generations. But realistically, I probably won’t care. And for now, I have more important things to worry about … like waxing my boat. This entry was posted on June 6, 2018 at 6:59 am and is filed under Retirement - Social Security, Social Security. You can follow any responses to this entry through the RSS 2.0 feed. You can leave a response, or trackback from your own site.